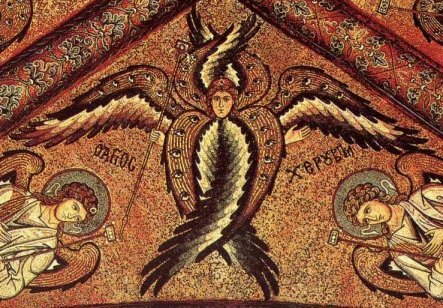 The word cherubim (singular cherub) comes from the Hebrew meaning 'effusion of wisdom'. It does not mean a chubby child. As previously mentioned, why angels became so we will discuss later. The appellation of the Cherubim denotes their knowledge and their vision of God, and their readiness to receive the highest gift of light, and their power of contemplating the super-Divine comeliness in its first revealed power, and their being filled anew with the impartation which maketh wise, and their ungrudging communication to those next to them, by the stream of the given wisdom. 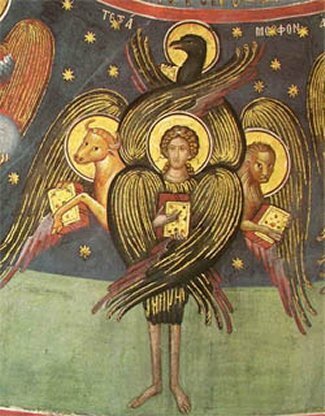 As mentioned, these descriptions provide the attributes of the four evangelists. But it doesn't make for an easy painting. Many images of cherubim pick and choose from this description. Most cherubim images have blue wings, but not always. The mosaic from the cathedral at Cefalu, Sicily, (left below) omits the four heads, but does emphasise the eyes. The fresco from the Meteora monastery, Greece, (right below) gives us the heads but not the eyes. 'And when the living creatures went, the wheels went by them: and when the living creatures were lifted up from the earth, the wheels were lifted up.' These wheels generally do not feature in images of Cherubim. The engraving is one of the few that does. The image on the left below by Jacopo di Cione is medieval, c1370. The red angels are the seraphim, the blue ones are cherubim. Already the angelic figures are more human-like. 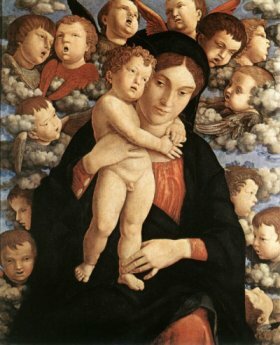 Mantegna's painting is just over a hundred years later; already the angels are more childlike, and the fashion for winged heads is under way. 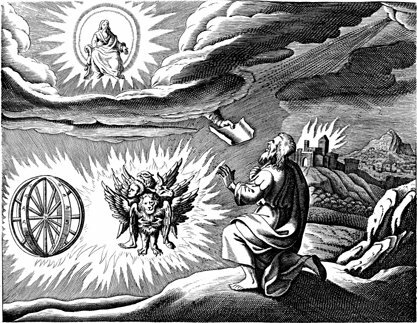 I talked about the first reference to cherubim in the bible in the section on the Old Testament, and commented on the discrepancy between the text and most images. Genesis tells us that the Cherub was given the task of guarding the gate, not chasing them out with a sword, as in the fresco by Masaccio below left. 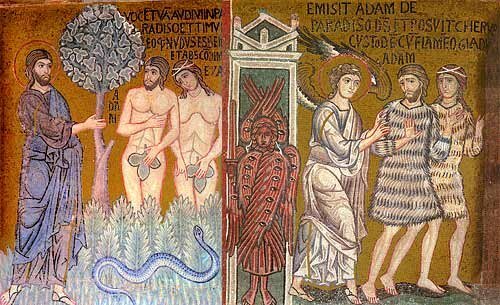 Why was entry to Paradise forbidden? It was nothing to do with that ability with swords; Cherubim were learned angels whose job was to protect knowledge. 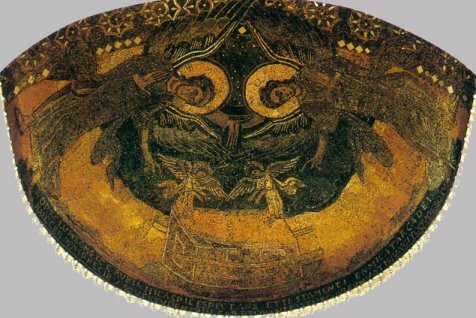 Gold cherubim were placed at either end of the ark of the covenant to protect it, as described in Exodus 25 v . 16 - 22, and shown in the very rare French mosaic from c800 below. In Genesis, their function was not chasing out Adam and Eve, but protecting the Tree of Knowledge. The mosaic below shows this perfectly - the cherub is guarding the gate, while a lesser angel is doing the chasing out. Mosic from the Palatine Chapel, Palermo, Sicily. *Of Wings and Wheels: A Synthetic Study of the Biblical Cherubim. Alice Wood.